The canal was part of ex-President Mubarak’s 1997 New Valley Project, or Toshka Project, consisting of building a system of canals to carry water from Lake Nasser through Wadi Toshka for irrigation in the Western Desert. Here in a “new valley,” agriculture and industrial communities could be developed in the hope of supporting a home for millions of Egyptians. In the process of this development, four major lakes developed from the diversion of water from Lake Nasser via the canals. The Toshka Project was supposed to be completed by 2020. Obviously, things have not gone as planned in Egypt the last few years, and ambitious, expensive undertakings like this have likely come to a standstill. From earthobservatory.nasa.gov: In the photo, a verdant green stripe marks out the banks of the Nile River in southern Egypt. 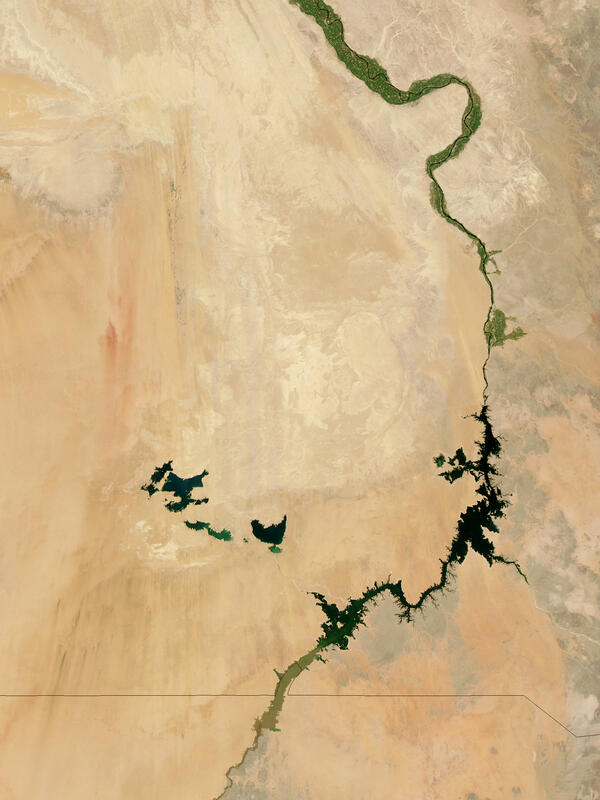 Near Egypt’s southern border with Sudan, the Aswan dam blocks the river, making it swell into Lake Nasser. To the left are the Toshka Lakes. 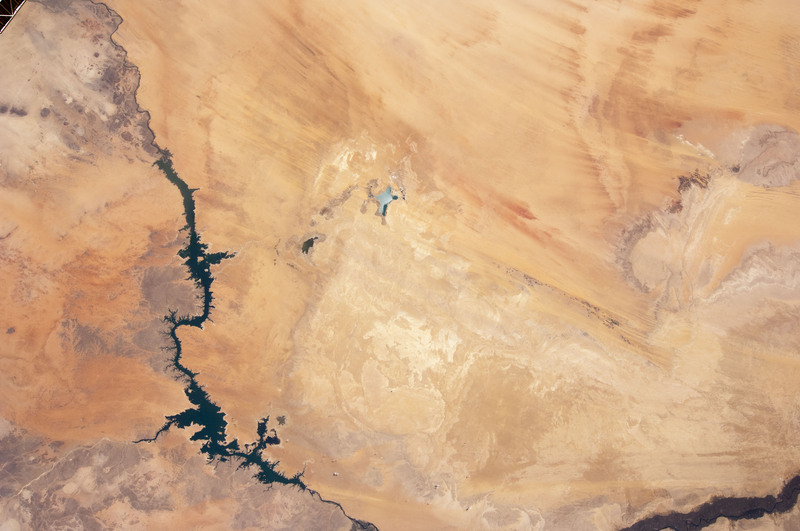 Egypt’s Toshka Lakes were created in the 1980s and 1990s by the diversion of water from Lake Nasser through a manmade canal into the Sahara Desert. Flooding of the Toshka Depression created four main lakes with a maximum surface area of about 1450 square kilometers—around 25.26 billion cubic meters of water. By 2006, the amount of stored water was reduced by 50 percent. In June 2012, water filled only the lowest parts of the main western and eastern basins—representing a surface area of 307 square kilometers, or roughly 80 percent smaller than in 2002. Water is almost completely absent from the central basin. 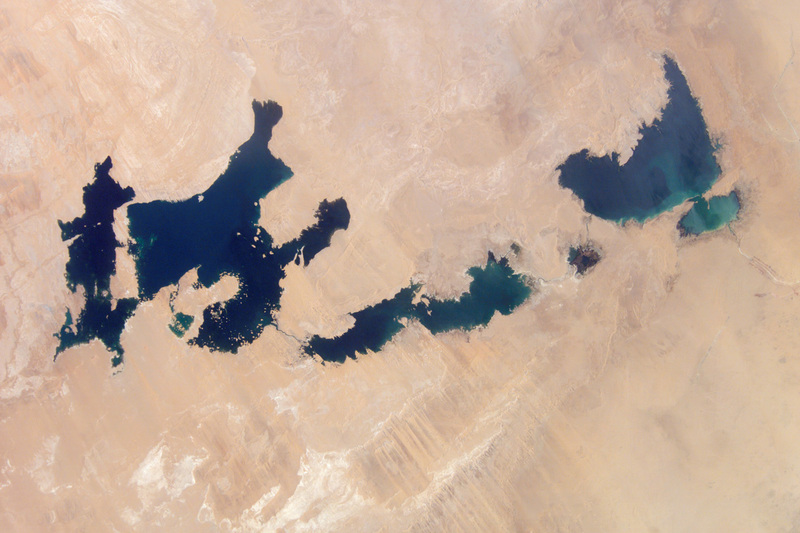 From space, astronauts documented the first lake—the easternmost one—in 1998. The lakes grew progressively as water flowed further west into each depression, with the westernmost basin filling between 2000 and 2001. The lakes were largely depleted by mid-2012, whereas water levels were at their highest in 2002. How long before Egypt’s Toshka Lakes completely dry up? In the decades they were there, did they support new wetlands, bird migrants, or become a refuge for Egypt’s crocodiles? Happy Easter and Happy Shamm al-Nisim!